Planning for kids' activities | Playground building toolkit | KaBOOM! It's important to become familiar with every aspect of your community's project before you begin organizing your team. Build a foundation of knowledge and record important information for later reference. Then, begin compiling your ideas for making this a great experience for the children in your community. Consider walking through our online Road Map so you can visualize the steps the whole planning committee will be taking along the way, and how children's activities fit into that picture. First, write down the basic information about your playspace. Over the next several months, you will be in constant contact with your co-chair(s) and fellow team captains. Ask your co-chair(s) for a complete listing of everyone's names and contact information, including the best time to call. You should also find out how many children each committee member has (and their ages), so that you can arrange babysitting services during meetings. As you probably already know, each member of the central planning committee (including you!) will head up his or her own team of volunteers. Construction team: This team will manage site preparation and the installation of the playspace, as well as any side projects. They will also be responsible for soliciting in-kind donations of tools and materials. Food team: This team is responsible for feeding volunteers (and children!) during planning meetings, Design Day and the playspace build. They will be soliciting food donations throughout the community. Fundraising team: This team will raise all of the cash needed for the project. This is a huge job; be sure to consult with them when creating and managing your budget, and when choosing businesses to solicit. Logistics team: This team will work behind the scenes to make sure everything runs smoothly - they arrange for meeting spaces throughout the planning, plus Build Day parking, restroom facilities, electricity/water hook-up, tents, tables and chairs. Public relations team: These folks are the project bullhorn! It's their responsibility to make sure that everyone in town knows about the upcoming build. They will work closely with local media and will also produce all promotional flyers, banners and posters. Safety team: This team has two main responsibilities: making sure that the playspace build is safe for everyone involved, and educating the local community about playspace safety. They will also work with the Construction Team to formulate a community maintenance plan. Volunteer recruitment team: Every playspace needs people to build it! If your community is using volunteer labor to install the playspace, this team will be responsible for recruiting those hard-working people. Under many insurance policies, build volunteers need to be 18. So how can children be involved in a playspace build if they're not allowed on the construction site? First of all, consider that it takes months of planning and coordination to pull off a fast-paced, high-energy community playspace build. There will be grassroots fundraisers, safety discussions, food preparation, volunteer recruitment, presentations to donors and potential partners, and media appearances — all of which are enhanced by involving children. The playspace project can be incorporated into math, science, history, physical education, social studies, writing and art curricula. You can host a community-wide contest to name the new playspace. On the days of the build, children can paint murals, plant gardens, write thank you's, serve food and drinks, have a "neighborhood clean up," participate in a special ribbon-cutting ceremony...the list goes on and on! And let's not forget about designing the playspace! Design Day is one of the things that really sets a community-build playspace project apart. Imagine children dreaming up their ideal playspaces, and then discussing their ideas with a professional equipment designer! For the first time in many of their lives, they will have a voice and a direct impact; they will see their dreams become reality. Get started with these ten ideas about getting kids involved. Then write down your own ideas with this form. Young people ages 12 to 18 are one of the great untapped resources for community action. In any local middle or high school, you'll find dozens of students who are energetic, idealistic, insatiably curious and eager to help! (Remember, too, that many schools now require their students to perform community service.) It's your job to give them an outlet and an opportunity. Develop and facilitate children's activities and games for the day(s) of the build; babysit children during committee meetings and fundraisers. Help measure, map out and design the play environment; create murals and other art projects. Help solicit in-kind donations for food; help prepare and serve food on Build Day(s). Sell raffle tickets; organize a car wash or bake sale; participate in a children's talent or fashion show; sing holiday carols for donations; write thank-you notes to donors. Prepare a skit or song for the ribbon-cutting ceremony; create and update a build countdown banner; provide quotes for the media. Be a part of the safety patrol for Build Day(s); pass out water to keep everyone hydrated. Distribute flyers around the neighborhood; help set up and run a registration table at the build. Youth council: Particularly ambitious young people might want to organize a sub-committee of their own. A youth council can be charged with various tasks and should report directly to you or your co-chair(s). For example, the youth council might be given a small budget to manage; they would then be empowered to distribute that money as "playspace environment grants" to other young people. The youth council would be responsible for selecting the best project proposals from their peers, awarding them mini-grants, and ensuring that the winning projects are completed. If your playspace site is near a middle or high school, a play environment beautification project is a great avenue for getting science classes involved. Plan and build an herb or vegetable garden complete with benches, writing boards, magnifiers and rulers built into raised beds. The beds can be arranged in a semi-circle to facilitate lessons, and students can decide what they want to plant. Apart from conducting science experiments, a student club might decide to contribute organic vegetables to the school cafeteria or to a local shelter, grow flowers to bring to a nearby retirement home, or start a school business. When it comes to the activities for Build Day(s), you will want to have a sense of how many children and youth you will have on site, and plenty of fun activities for them. But while they can't work on the construction site, that doesn't mean that kids can only sit and draw pictures! No matter how young, there is always a way for kids to contribute to their playspace during the Build Day(s). Planting a garden, painting 1x1 mural squares, creating mosaic stepping stones -- activities that will be incorporated into the playspace as beautification projects will give the children a lasting pride in their playground and in volunteerism. Did you know that you can enhance children's academic experience while engaging them in the playspace project? Welcome to service learning! Service learning is a teaching method that combines academic instruction, meaningful service, and critical reflective thinking. It differs from simple community service or volunteerism in two major ways: 1) the service activity (in this case, the playspace project) is integrated with academic curriculum and content, and 2) students engage in structured reflection of their service experiences and apply their learning in real life activities. If your project is not currently affiliated with a particular school, bring the service learning concept to local teachers or childcare providers and get them involved! Learn more about service learning. 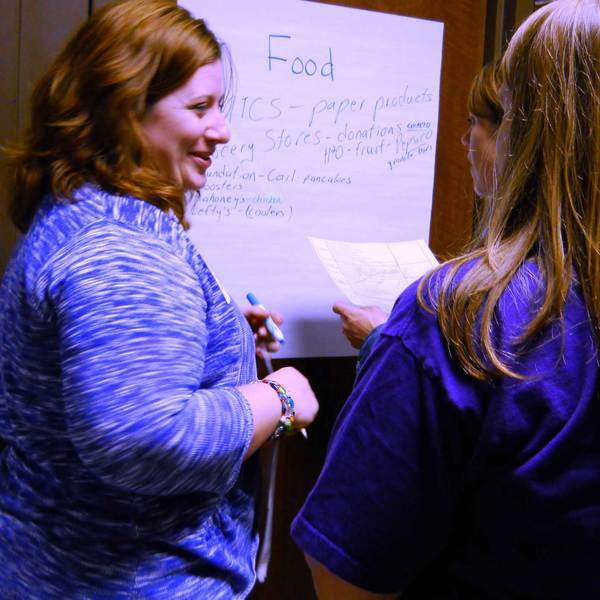 If your project is closely tied to a specific school or group of educators, consider developing a complete service learning curriculum that will both mirror and interact with the activities of the planning committee. Service learning sessions might include: playspace design; the structure and function of city/county government; public health and safety; build logistics; project fundraising; public relations; and volunteer coordination.